One Card, Zwei Mode! NDS Spiele oder 3DS Spiele, können Sie mit einer K3DS Card verwirklichen! Das ist eine funktionale 2in1 3DS Flashcard, das heißt, dass Sie können 3DS oder NDS ROMS mit K3DS ohne andere Switching einwandfrei spielen! - (16-Juni-2014) Unexpected leak of our website and card. - (30-Mai-2014) The release of our revolutionary new product: The K3DS card! 1. Supports all ROMs to date including WiFi. 2. 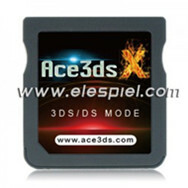 One Card, 2 modes (DS & 3DS mode in one card). 3. Hardware switch for changing modes. 5. 4GB storage included in card. 7. Supports MicroSD cards up to 64GB storage. 8. Independend Game Kernal and FW upgrade. 10. EmuNAND with 7.2 support. 13. 3 different languages included.